Sorting through the clutter in the shed at the weekend, I found a few old track plans that date back to some time B.C. (Before Career). Growing up I was fortunate enough to have a bedroom big enough to swallow, at first, a OO 12′ x 4′ “train set”* which then had a bit of OO9 squeezed in and mutated through several permutations of the heavy chipboard baseboards into what you see below. This was 8′ x 2′ along one wall, followed by a small 1′ square piece to step around a chimney breast, and then a further 4′ x 2′ on the next wall. In concept it was a kind of all-preserved Blaenau Ffestiniog, with an ex-GWR branchline arriving through the hills on the high level and narrow gauge below. I envisaged the NG site as being the former junction between passenger and quarry lines, hence the space for multiple tracks, and that both railways would once have continued to the right – standard gauge to an interchange yard and narrow all the way to the coast. I actually got (by my standards) a fair way along with this before moving to London to begin work at 19. Once I was settled I managed to get one of the boards along with me, with plans for something smaller, but this fizzled out before much progress was made and all my stock was put away again for the best part of a decade. If I’d known then that the G&DNGRS was, relatively speaking, on my doorstep things might have turned out quite differently. 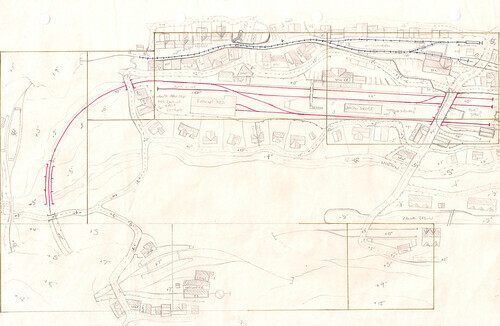 Of course a fairly modest track plan typically spawns wilder and more ambition variations, and mine was no different. Here the narrow gauge has swapped elevations with the standard, and the whole thing curves right around into a U shape with a standard gauge fiddle yard and small dockside scene, while the NG line continues via a passing station to a larger base up in the hills. I have even roughed in the scenery in the space left by the operating well to get an idea of how things fitted together. * Never finished of course! This entry was posted in 009, ideas, model railways, narrow gauge, old, track plans. Bookmark the permalink.